I'm cooking asparagus and bokchoy with chicken. This simple home cooking recipe requires several spices, vegetables and chicken. It's an easy recipe, promise! You'll enjoy cooking this dish at home. I used Daidomon barbeque sauce and Datu Puti soy sauce in cooking asparagus and bokchoy with chicken. I got the BBQ sauce from a friend, so I figured why not give it a try in cooking. It has a sweet-salty taste which is a nice twist for our recipe today. If you can't kind this in stores near you, I suppose other light BBQ sauce would do. At the least, you can also use Kikkoman's all-purpose soy sauce. Cooking bokchoy with spice, spice and spice! 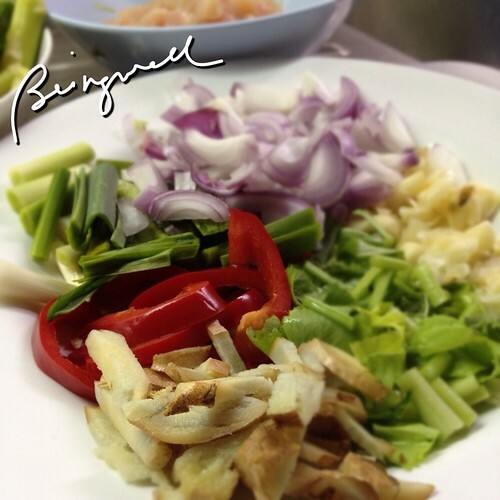 Let's start cooking asparagus and bokchoy with chicken! 1. Pour in oil in a hot pan. 2. 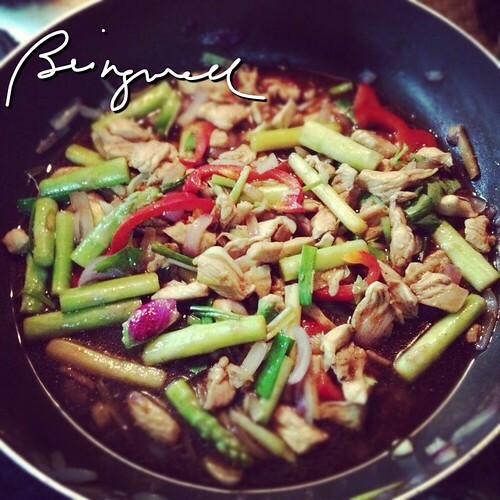 Stir-fry the chicken with garlic. Set aside when cooked. 3. Season the cooked chicken with salt and pepper while resting. 5. Add in the onions, scallions and ginger. Mix well. 6. Add in the asparagus. 7. Add the seasoned chicken. Mix well. 8. Mix in the red bell pepper. 9. 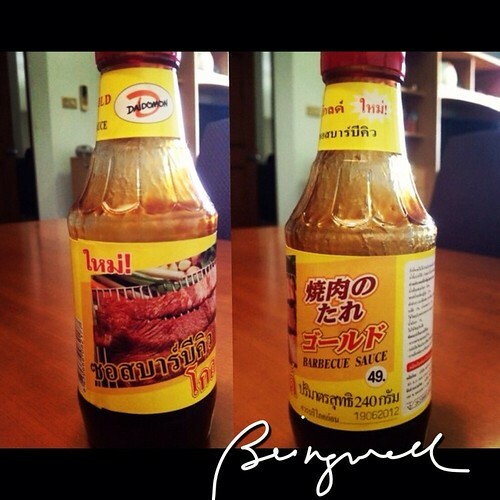 Season with the BBQ sauce and soy sauce. 10. Add a little hot water to prevent the dish from drying. 11. Lower the heat and let it simmer. 12. 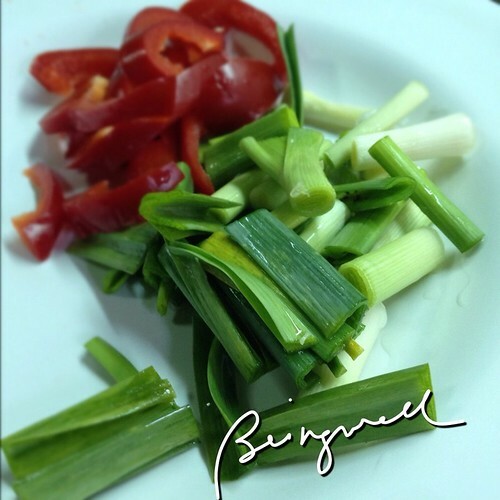 Add the chinese celery. 13. Add more sauce, according to desired taste. 14. Add the bokchoy last. 15. Remove from heat without the lid to prevent the vegetables from over cooking. 16. Serve while hot with rice. 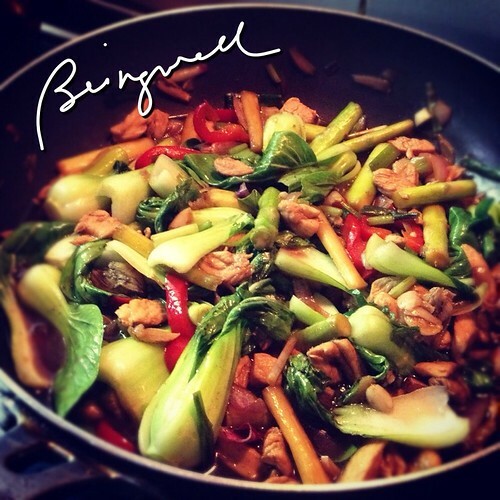 Cooking asparagus and bokchoy with chicken is quite easy to do. The spices in this recipe mix well together. The sweet and salty taste of its sauce makes it even more divine. Remember me when you try this dish! Parang ang sarap naman nyan, magaya nga! Ang sarap! I was wondering what is bokchoy. It's a Chinese cabbage. Now I know it. 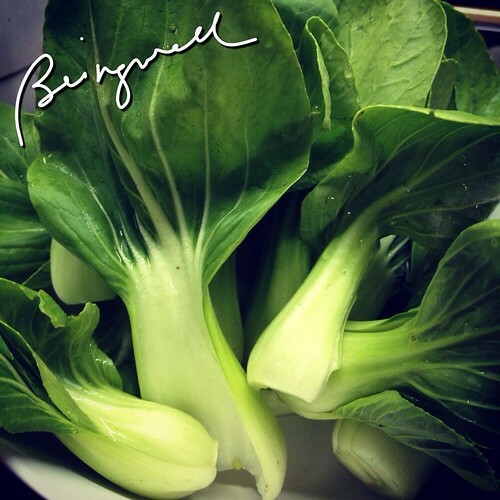 I have bok choy and was thinking what to do about it. i might try this recipe minus the other ingredients. i did cook one of your recipe yesterday with some changes ,kung ano lang available sa pantry ko .